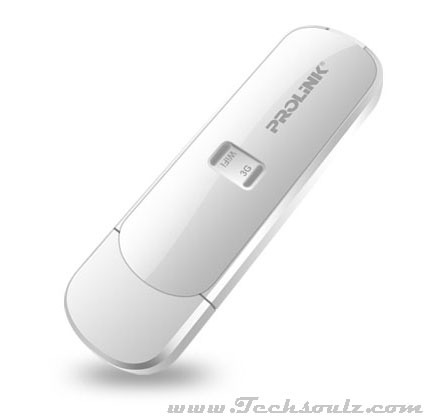 At ﬁrst glance, the Prolink PRT7002H 3G HSPA+USB Modem Router looks a lot like a ﬂash drive, albeit one that’s a little larger than usual. It comes with support for both 850MHz and 2100MHz bands for 3G, and allows for internet connection via wireless hotspot with up to 10 users. Additionally, a micro SD card slot lets you share data on the card among users connected to it. To start off, the top cover requires a little bit of nifty prying before you can get it off. Below the cover are both the SIM and MicroSD compartments. Do note that both Micro and Nano SIM cards are not supported here unless you have the right SIM adaptor. Setup is, thankfully, straightforward. After ﬁtting the cards into the USB modem router, connect it to a power source, such as a Power Bank or USB charger, and search for the WiFi network on your computer. Barring that, you can simply connect and access it like a USB drive on your PC. To access the WebGUI conﬁguration page, simply enter http://p.home on your computer. Here, where you can access ﬁrewall settings, select a security mode for your WiFi hotspot, as well as to conﬁgure Administrator settings. While the growing number of networks and devices supporting LTE may make the Prolink PRT7002H look a little outdated, 3G is still the safer choice when traveling.